Merilumi creative groups and Personal Merilumi sessions forming now. Sign-UP for Fall Merilumi women's and girls' groups here. Merilumi women's creative groups are 3 or 4 women, already friends, or individuals forming a new group. 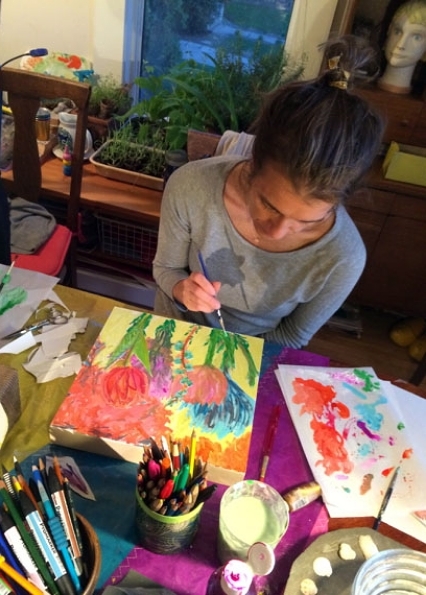 We gather one evening or morning per week, for 3-6 weeks, to explore special Merilumi content and life topics, learn new skills and perspectives, and create art together! Each participant will create smaller works, and one central art piece with the close guidance of Beth. Merilumi increases creativity and clarity, renews playfulness and curiosity, opens our purpose and wholeness, and encourages understanding through collaboration. Art, like nature, is a regenerative process, at once bold and vulnerable, and a passage to our true worth and vibrancy. Be Meriluminous with us! October-December groups forming now- sign-up. Prices start at $150 per person plus $25 materials for 3 weeks. Example projects include Art Pillows, Paintings, Pendant Lamps, Handbags. Merilumi girls' creative groups are 3 or 4 girls gathering 2 hours weekly for 6 weeks. With art and expression as a foundation, we explore life in the moment, and our creative visions for our futures. Merilumi for girls offers an exceptional opportunity to deepen social connection and self-esteem through collaboration, learning new skills, validating our gifts, mini-public speaking, sewing and creating with a variety of media, and writing. Suggested ages are 7-9, 10-13, and 14 up. Take a sweet dip in Merilumi waters and shine! October-December groups forming now- sign-up. Prices start at $200 per person plus $30 materials for 5 weeks. Example projects include Art Pillows, Paintings, Pendant Lamps, Handbags, Art Books, Tee Shirts, Skirts. Merilumi one-on-one with Beth is perfect for women or girls wishing to explore their creative gifts and art media in a safe, inspiring, colorful setting. We will create a unique, central art piece and smaller works. Emphasis on finding our true value, and emerging open-hearted and smart in the flow of everyday life. Wonderful for healing through loss, bridging transitions, envisioning our goals, and rising to our own celebrations! Find your Merilumi song! Merilumi can be custom crafted into your organization's program or retreat. Special projects by commission. I found myself easily removed from everyday craziness and transplanted into a creative and inspirational environment the minute I stepped into the Merilumi space. Beth has the ability to allow the artist within all of us to gracefully come out as she shares her talent and supports the growth of our creations. Surrounded by French music, fresh flowers, a rainbow of oils, a few good friends and Beth's authentic energy, my artistic side joyfully came back to life thanks to Merilumi! I loved the experience of Merilumi. Beth helped me take the kernel of a creative idea and turn it into something meaningful with a lot of relaxing fun along the way. I can’t wait for my next Merilumi group – I plan to bring my sisters and mother.